Switzerland on the Gold Standard? On November 30 of this year, the citizenry of Switzlerland will vote on a new initiative to back the Swiss Franc with gold, halt all Swiss gold sales, and repatriate all Swiss gold held abroad. This would engender long-term stability in the Swiss economy and restrict the growth of what is already a relatively unobtrusive government. It could also exacerbate the instability inherent in the rest of the world's fiat monetary systems, including the US Dollar. The "natal" chart for Switzerland is interesting, but for now let's just look at transits and progressions against that chart for the upcoming election. Transiting Uranus-Pluto square forming a "learning triangle" against Swiss Jupiter. Jupiter in the Ninth may reflect public policy, and Jupiter also rules the Second House of money and the Fourth House of the homeland. Big changes appear to be afoot in these areas. Transiting Mars conjunct Progressed Mars square Swiss Pluto: a big shakeup to the power structure? Pluto also rules the Swiss Ascendant. Progressed Mercury quincunx Swiss Venus: information/verbiage/communications regarding money. Transiting North Node conjunct Swiss Pallas: a significant increase in non-aggression (Pallas). Transits and progressions that strengthen Pallas tend to coincide with the rollback or restriction of government action. This might be consistent with the government-restrictive properties of a gold standard. Transiting Pallas on the Swiss Ascendant, sextile Swiss Sun, septile Swiss Mercury, and semisextile Swiss Pallas: A significant libertarian-friendly development. Transiting Vesta and Venus entering Swiss Second House. Interesting and probably good things regarding money. 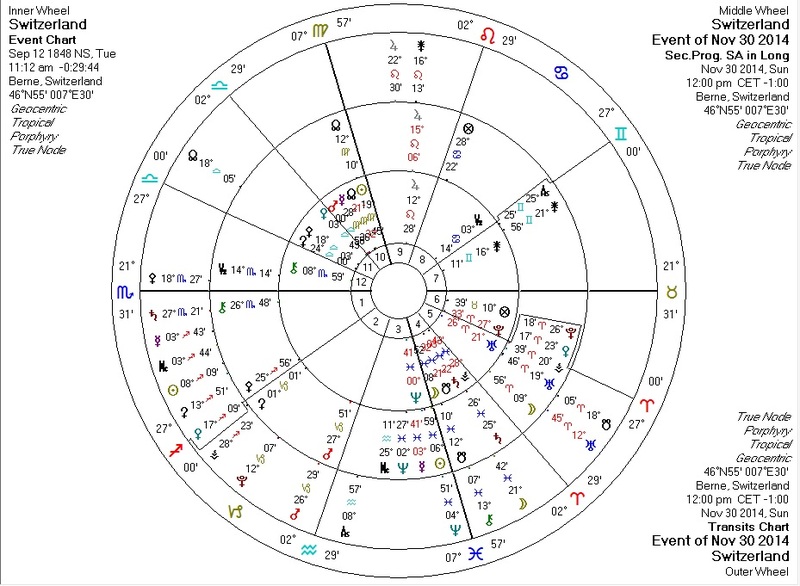 Against the US Sibley chart for this day, the Uranus-Pluto square continues its assault on the US Sun and transiting Chiron (injury/adjustment) is trine the US Sun. Against the Bitcoin chart, transiting Jupiter is opposite Bitcoin's Neptune, ruler of Bitcoin's Venus. Neptune is always tricky, but one could imagine that a weakening of the US dollar by a significant nation such as Switzerland might boost prices of non-dollar assets such as Bitcoin. I think Switzerland will vote "yes" and that there will be ramifications which will trickle out to have worldwide effects. I think this could end up being quite a big deal.